We are now in the sun sign of Pisces (February 20 – March 20). 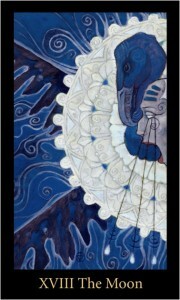 Pisces is represented by the Moon in the Tarot (Major Arcana, #18)*. The Moon may cause us to lose our way because the moon is out with the dark of night. There are shadows in the darkness, and we don’t always know what could be waiting just around the corner. Fear, anxiety and strong emotions are often associated with this card and zodiac sign. In readings for/about women, The Moon can also indicate hormones at play (i.e. pregnancy, PMS, menopause, etc.). This is also a time for phases; understanding the need to go through phases of growth, building things up, breaking them down and building them back up again. During the period of Pisces you may find you are working with strong love and emotions, maybe with a touch anxiety or insecurity because you don’t know, or can’t foresee, the outcome. Don’t feed the fears! This period may also be punctuated with timing; new cycles beginning or coming to an end; things phasing in and out of your life like the phases of the moon. Genius, vision and pure inspiration are often qualities possessed by those born under this card. The Moon hides things in the shadows which may lead us astray, or it could cause bewilderment and fear. You need to trust that you can safely move about in the dark without a clear picture or understanding of where you are going. Your feelings can guide you properly if they are balanced and in line with your keen intellect. When allowed to rule unchecked, your emotion could lead you astray. The darker aspects of this card often represent depression or moodiness usually caused by anxiety of the unknown. This can lead a person to an over-dramatization of what could happen and not necessarily the rational truth of what is really happening. You must remember to channel your innate intuition and have more faith in your success. Work on trust and security. anxiety, fear, pisces, pisces astrology, pisces tarot, strong emotions, tarot moon, the moon. Bookmark.